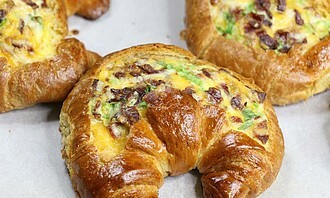 Enjoy a wide variety of breakfast options with a tropical twist. Please tell us of any allergies or preferences we can provide vegetarian, vegan or gluten free choices. (Celiac awareness) Homemade and locally grown products. Fresh fruit, juices, coffee and teas,bacon & eggs, sausages or back bacon, breakfast casseroles, quiches, muffins, homemade honey and jams - including our exclusive blue hawaiian jam and local coconut honey. Our signature fruit puff pancake or waffles topped with seasonal fruit, local maple syrup or savory fillings. Yogurt parfaits and a selection of breads, buns or muffins. We have a 24 hour drink and snack station. Come and discover our baked pancakes - full of local seasonal fruit. You will find us in the 2013 Norfolk County Ontario's Garden Recipe Book. Recipe: Pancake batter for 12-14 pancakes, mixed and set aside 1 1/2 cups mixed raspberries, blueberries and sliced strawberries, 5 tbsp. maple syrup, 1 tsp cinnamon sugar. Preheat oven to 350 F, spray glass pie pan with butter spray and place fruit on the bottom, drizzle maple syrup and sprinkle cinnamon sugar over the top. Slowly pour batter evenly on top. Bake for 25-35 mins or until tester in center comes out clean. Loosen edges and cut into wedges, sprinkle with icing sugar and serve warm with local maple syrup. This dish can vary according to the season and local fruit available. Annually we sponsor the Junior Fair competition for the 'My Favorite Muffin' category for ages 9-12 yrs and 13-17 yrs. The prize winning muffins are featured in our breakfast menus. Winning recipes include Best Ever Muffins, Gramma Adeline's Blueberry Muffins, Pumpkin Streusel Muffins, Carrot Muffins,Banana Muffin and Pumpkin spice Muffins. 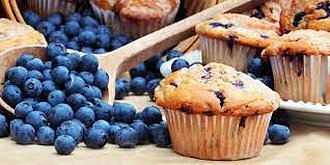 Here is Gramma Adeline's Blueberry Muffins by Gillian 1/2 cup butter 1 cup sugar 2 eggs 1 tsp vanilla 2 cups flour 2 tsp baking powder 1/4 tsp salt 1/2 cup milk 2 cups blueberries Beat butter, add sugar then eggs one at a time. Beat together and add vanilla. Mix flour, baking powder and salt together. Gradually add to the butter mixture alternating with milk. 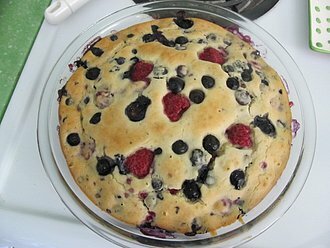 Fold in blueberries. fill muffin tins to the top and sprinkle with 1 tbsp sugar and 1/4 tsp cinnamon. Bake 375 for 20-25 mins.